Ya know, there are just some days where there is not much to say about the outfit. The best thing I have going with this look is the colors. I dare say that without the colorful appeal, it might be a bit bland. On another note, I'm trying out Zumba for the first time. (#dontjudgeme) Have any of you tried it out? Is that a Forest Gump quote? :) Cute sandals, dear! Have fun at Zumba, I've never tried it! I love those gorgeous sandals! Fabulous top, skirt, crossbody bag and sandals. I don't think it's bland at all. Looks great! I heard Zumba was fun. Have a great time! loving this look! it's so cheerful! I haven't tried Zumba because I have the worst hand/eye coordination. That is, I have ZERO. Love the colors in this outfit, Nancy! 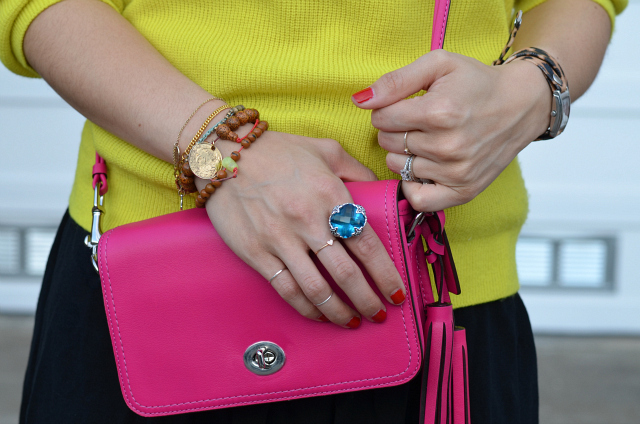 This colourful look is so wonderful!! Colours are the best way to make any outfit pop. And i must say the little bit of neon detailing on these shoes is fantastic! Great colour combos and YES def try zumba. I def swear by it. It soo much fun. Lovin those layerd necklaces and your color combo. Cute! 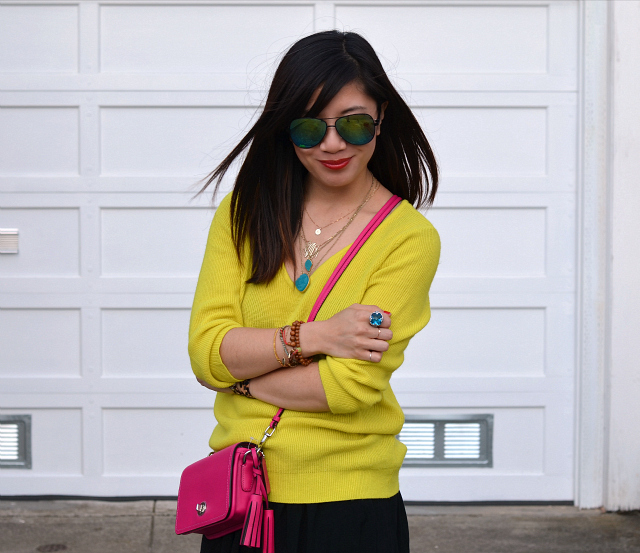 The color combos in this outfit are so fun! And I wish I could do zumba but I have no coordination and wouldn't be able to do any of it! loving the hot pink Tory!! of course that sweater is thrifted. all the good stuff is! you look amazing. What's your favorite thrift shop? I love those shoes. And the layered necklaces. I can't seem to do layered necklaces as well as you! Such a cute outfit. Love those shoes! I've done zumba- it's actually a super intense workout! I was exhausted by the end! That is a great outfit and I am loving your sandles!!!! I have never tried Zumba, but here its a lot of fun and a good workout, hope you enjoy! So funny that many people haven't tried Zumba before. For those that have no coordination, seriously you don't need it! It's the same few things over and over again, and by the end you're a pro! That being said, I think it's a fun workout, but I never work up a sweat, wonder if I'm just not doing it right? the color combos are so pretty! Omgsh, I love zumba! It never feels like a workout to me, its just a dance party :) I've been taking it this semester and feel myself getting a better cardio and core workout than I ever have by just hitting the gym. Its great! So darn cute. Enjoy zumba!! Your shoes... I want! You look great, love the bright colors. the colors in the outfit are perfect! Well I immediately jumped over to that AA skirt. What a great item for spring and summer, and even fall and winter when paired with tights. I'm going to have to pop over there during lunch next week and try her on for size. Love the combo here! Keep working those neons, girl. I've got 2 left feet and not rhythm so there's no way I will do Zumba. My girlfriend lend me her Zumba videos and I tried to do it at home and I was horrified at my lack of coordination. I turned it off after 5 minutes of struggling. I am a Crossfit junkie. This is a great outfit - love the sandals. I always love how you layer your necklaces so well! you always have the best shoes, i swear! Lovely look, as always! Even your simple outfits look so chic :) I want to hear all about your Zumba class though, I've never tried it but have only heard good things. What an adorable mix of colors.....& I'm so in love with that monogram neckpiece I'm ordering it now...haha! The colour are fab here. I need those flats! So cute.